docker build -t gaia . docker: Error response from daemon: linux spec user: unable to find user app: no matching entries in passwd file. What could have gone wrong with the docker build or run? Does it require a specific docker version to build the container (mine is 18.06.1-ce)? So, "app" user never exists inside the container, I just wonder whether this is it or the docker build process runs into trouble creating "app" user. Definitely boils down to a missing "app" user. The specifics of why that is would require more digging. I think I nail the problem. 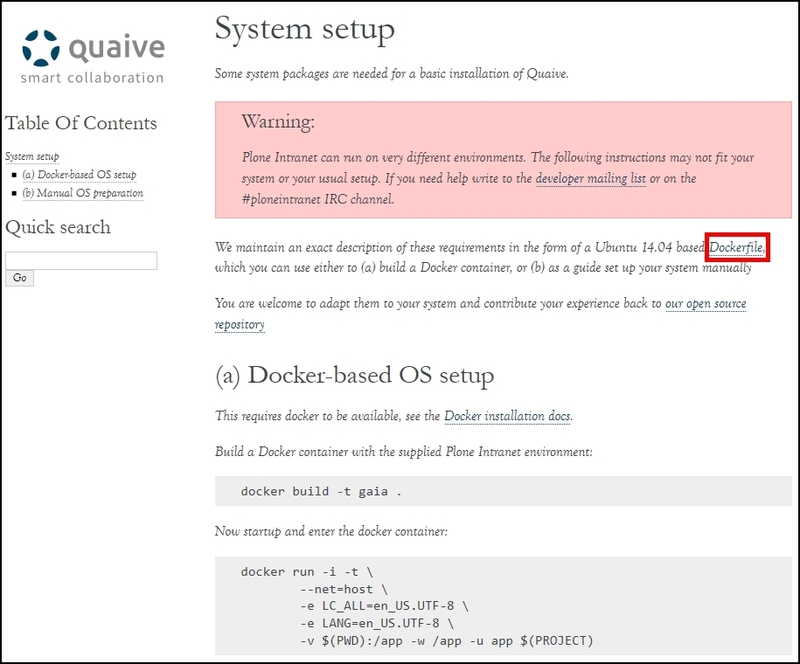 The misleading Dockerfile link https://github.com/quaive/ploneintranet-docker-base/blob/master/Dockerfile (see attached image) at the page https://docs.ploneintranet.org/installation/system-setup.html leads one to the Ubuntu 16.04 based development install package, instead of the Ubuntu 14.04 based quick start deployment package. I am not totally sure about that and currently stuck in my YMMV moments to get the hang of it !! !